NRG Steering Wheel - Deep Dish Series UNIVERSAL - Pann Auto Performance - San Diego largest aftermarket automotive performance parts - What do you drive? 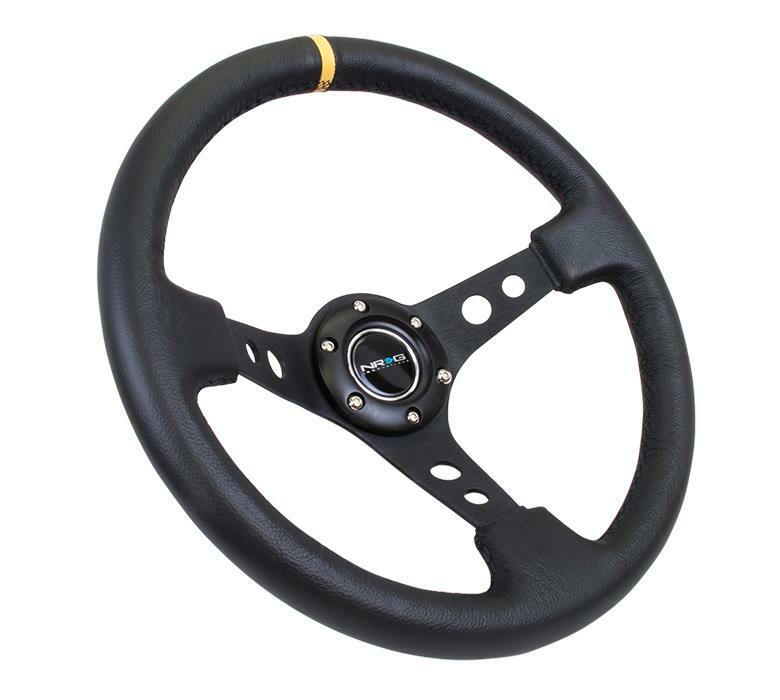 The RST-006 Series is a 3-Inch deep dish round holes sport steering wheel is made from high grade aluminum ( 5mm) spoke for style and performance, and wrapped in high quality leather or suede. Available in 350mm and many color spokes. The RST-016 Series is a 3-Inch deep dish round holes sport steering wheel featured double center mark to assist the driver of how much steering is dialed in. The three spoke dish design is made from high grade aluminum (5mm) for added style and performance. Wrapped in high quality leather or suede for that aggressive look. Available in 350mm and many other color spokes. The RST-022 Series is a 3-Inch deep dish two spoke “NRG Arrow” cut out sport steering wheel featured single center mark to assist the driver of how much steering is dialed in. The two spoke dish design is made from high grade aluminum (5mm) for added style and performance. Wrapped in high quality leather or suede for that aggressive look. Available in 350mm. The RST-021 Series is a limited edition 1.5” deep dish two spoke hydro dipped steering wheel featured yellow center mark and Japanese inspired graphics. Available in 310mm. The ST-036 Series is a 3-Inch deep dish sport wheel with neo-chrome, chrome silver, black, and gold three solid spoke dish design. Made from high grade aluminum for added style and performance. Either wrapped in high quality leather with red baseball stitching or luxurious stylized wood, they have a superb feel and look to them. Available in 350mm. The ST-055 Series 3-Inch deep dish sport steering wheel. The three cut out spoke dish design is made from high grade aluminum ( 5mm) for added style and performance. Wrapped in high quality leather or suede for that aggressive look. Available in 350mm.